In the past, there has been some controversy over whether or not AhnSahngHong ever had children. When I was a member of the World Mission Society Church of God, I was told on more than one occasion that AhnSahngHong was never married or had any children. After some research into Ahnsahnghong’s life, not only did I discover that he had established another church called AhnSahngHongs’ Witnesses, now known as the New Covenant Passover Church of God, but that AhnSahngHong was in fact legally married to a woman named HwangWonSoon and had four children. However, now it appears as though the WMSCOG openly admits that AhnSahngHong and ZhangGilJah had both been married and had children with their respective spouses. It seems as though the way that the WMSCOG describes AhnSahngHong’s life to its members and what the actual evidence shows, just does not add up. Let’s take a look. AhnSahnghong hardly suffered alone since as the documents shown below demonstrate, he was married and had four children. AhnSahngHong also does not appear “feeble with weary legs” in this picture of him standing in a river nor in this picture of him swimming at the beach. Yet Ahnsahnghong is seen here eating a meal with other members of his church that clearly includes plenty of solid food and here AhnSahnghong is photographed standing behind his 3 tier birthday cake. Clearly, there are a number of inconsistencies between the WMSCOG’s portrayal of AhnSahngHong’s life and the evidence that we have available. Yet, another contradiction stands out. WMSCOG General Pastor Joo Cheol Kim’s view on family and love being “temptations of Satan” does not reflect AhnSahngHong’s actions with respect to the same issues. It is obvious that AhnSahngHong did not believe that family and love were temptations by the devil since he was married and decided to have four children. It also is apparent that a marriage and four children did not interfere with AhnSahngHong’s important work of establishing a new church, “restoring the Passover”, and preaching to the public. Three of his four children were born after AhnSahnghong’s baptism into the Seventh Day Adventist Church on December 16, 1948. You can see the proof in AhnSahngHong’s official family census record below. WMSCOG Hosts “Family Togetherness” Event At Middle School? Family and Love: “Temptations of Satan” According to Joo Cheol Kim? How could this dead man and his concubine when he was still alive became gods? People turning their worships to this man-made gods are either retarded or insane. All in this WMSCOG is foolishness and teaching members to turn away from the TRUE GOD. They are but committing the greatest sin against the Commandments. YOU dumb members, wake up and pack-up for you are but being lied to and deceived by koreans. GOD has no nationality and nobody seen HIM face to face. This church has brainwashed their memebers to think God has chosen South Korea as their holy ground. They makes their people memorize prays in Korean and females to wear veils during service…like the hair on my head is sinful but men’s are not? !I witnessed their ceremony last night, the celebration of tubernacles and ran for my life. Yes everything you say is very true. I learned about the feasts and according to them you have to keep all of them to be saved. Plus I don’t believe their versions of the Bible. Yes you are absolutely right, the WMSCOG is a biggest cult on this earth. Remember the devil will be very powerful in the last days, the result is in front of us. This is the the that has destroyed OUR JESUS CHRIST. GRACIAS A UD., NUESTRO EVANGELIO PROSPERA, ES LO MISMO HACE DOS MIL AÑOS LOS OBSTACULIZADORES PROPAGABAN FALSOSO RUMORES DE JESUS. Pero bueno ustedes existen porque tambien cumplen una profecía en la biblia y solo hacen su trabajo, los felicito. that WMS has painted this picture. You see AHN on vacation, eating meals(not just porridge). In another video, Zhang spoke about a sister who visited ASH and he lived by himself. We need to face the facts, about truth vs. A lie. Its not about “Man can’t undrrstand as God does”, question is, “Can God Lie?” If the answer is, No thrn Ahn isnt God. Saying that AhnSahngHong is not Christ simply because he’s Korean is like saying that Jesus is not Christ because he is a Jew. The location and nationality is irrelevant. Where in the bible does it say that God is not allowed to marry or have physical children? The bible says that christ came to be like man in every way. The church has never lied to me about AhnSahngHong having a wife and children. I’m going to give the individual that told you otherwise the benefit of the doubt by saying that he/she probably didn’t know that information. Not everyone has the same level of knowledge. I think its also important to note that AhnSahngHong and Mother never had a physical marriage. Or a physical relationship for that matter. the marriage ceremony was only symbolic in nature. It was never intended to be a physical relationship. Now Lets look at what Apostle PAUL said it is Better NOT TO MARRY why?? Now the issue is not that He did . Exactly, Joseph. The lies are the big problem with that church. They are lying to hide something, and I think we all know what it is already. now…compare the teaching that you’ve learned from the WMSCOG to other churches…think about that.. Yes brother you are absolutely right. They never discuss or speak anything about the real life story of both the false gods, If they disclose then they will be proved humanbeings. It’s not about man can’take understand as God does.question is, “Can God LIE. If the answer is no, then tthey are God. People have been deceived and fooled by the WMSCOG very badly, I do know when they will understand the difference between SUPERNATURAL and Natural, SINLESS and SINFUL, PURE AND IMPURE, HOLY and UNHOLY. No doubt the devil wants people to be away from worshiping the one and only One God, God the Almighty. It’s not shocking, the devil has doing this right from the beginning,the devil has been playing and misusing God’s word that’s exactly what he wants,NO doubt he has made the WMSCOG his deadliest weapon to keep people away from worshiping the true Almighty God. The result is in front of you the false christ and the false god the mother. The mere fact that the so called “heavenly parents” went on to marry others causes so many problems with the teaching of this group. And frankly distorts Christianity. Because if they were the ones who created mankind in genesis why then did they go ahead and marry their creation? God as we know is omnipresent so why would they marry their creation when their eternal spouse is witnessing the infidelity? Father marries another woman and has three kids with her and mother marries another man and has children with him. How is this making any sense? Why did Jesus have brothers? It doesn’t make sense. I’m trying to understand what Jesus’s brothers have to do with the lie of this cult that there is a mother god? The pictures that you shared don’t exactly prove whether or not Ahnsanghong suffered. All it shows is that he ate food and swam in a lake. the one picture of him eating food only shows him eating healthy food for that particular day. what about the remaining 6 days of that week? Did he eat? if so, how much? I will say that he isn’t exactly a skinny man. But then again, neither am I. I used to go days without eating back when I was homeless. But you know what? I’m still fat. Not all starving people are skin and bones. also, we need to ask ourselves “When”. When did he suffer? Was it before or after he established the church? Everyone knows that it takes a LOT of suffering and sacrifice when starting something new. But after it thrives, is he not allowed to enjoy a healthy meal with his fellow believers? I’m surprised that a men of the WMS would even try this question. I’m sure you’re trying to lead the conversation into something about prophesy. That’s really what this whole website is about. The WMS translation of the Bible and the prophecies is false. Here’s another idea you might want to consider, if you’re going to try and discredit Jesus the why would it matter to you if Ahn was the second coming of Jesus? Either you believe Jesus is God and what He said was true or you’re wasting your time. Please show us where Jesus taught the disciples about a mother god or a third time He was going to come and I’ll gladly stop questioning the idea of Ahn. The truth is that the church never speaks anything about Anghsunghong’s life before he was baptised, this itself proves that Anghsunghong by birth was Buddhist, we believe that Jesus Christ came in human form but at the same time he was supernatural. The record of Jesus christ right from his birth to death proves that he was supernatural. But Anghsunghong record from birth to death is not supernatural. In reality Anghsunghong did not fulfill any prophesies .The church the general pastor has very cunningly misused God’s word and has made his own doctrine only to make humanbeings gods.for example the verse in Heb 7:3, god has to come as a gentile, a gentile is one who worships Idols. Why would God be a gentile, if it is, then the first commandment has no meaning, Melchizedek is God, and is supernatural, no beginning no ending, no genealogy, and no religion. Ourban god is jealous God, why would God become a gentile, Jesus said I came to save people not make religion God does not have religion. Restoring the passover, the feast does not make anyone god. Ahnsanghong did not establish this church. This church was established a year after Ahnsanghong’s death in 1986 by his Son. Any evidence to prove this? An undoctured picture on their website, shows him preacing and in the background on a banner is their church eblem, the same one used today. God says over two hundred times in the Bible that He is the only One. Do you think God lies? Members get so focused on the other trivial things that the leaders tell them to focus on that they miss the major things of the Bible. Think outside the box. The Wms IS THE BOX. God never lies, do you know? what about us? what about you? Do you know that because of your lies God came again in the flesh suffering the physical pain that only us sinner must feel? I want you all to know that when Jesus came a first time many are like you who reject and slander the truth Jesus came to preach. Do you know how hurt is it? Do you know how hard the feelings of the apostles who saw how people reject Jesus at that time? And now do you know that your doing the same fault as what the people who didn’t gave respect to Jesus 2000 years ago? Jesus came a second time just for us to know the truth carrying the new name Christ Ahnsahnghong. We, the members of the WMSCOG will never leave and betray the church that gives the truth. And we encourage you to please listen to the truth and listen to the voice of Mother and met Father in the air when the last judgement will come. The first time Jesus came and died for us his true followers mourned him! After his resurrection they celebrated Him. NOW your group reject Him and replace Him. Know the REAL truth and free yourself from this entrapment! This group does not give truth it distorts the truth! I’m glad you’re looking around here. You have a lot to learn about your group and the real truth about what you’re being spoon fed and how abusive this group really is. You should study with them before you slander things you don’t understand. They worship Jesus as well. 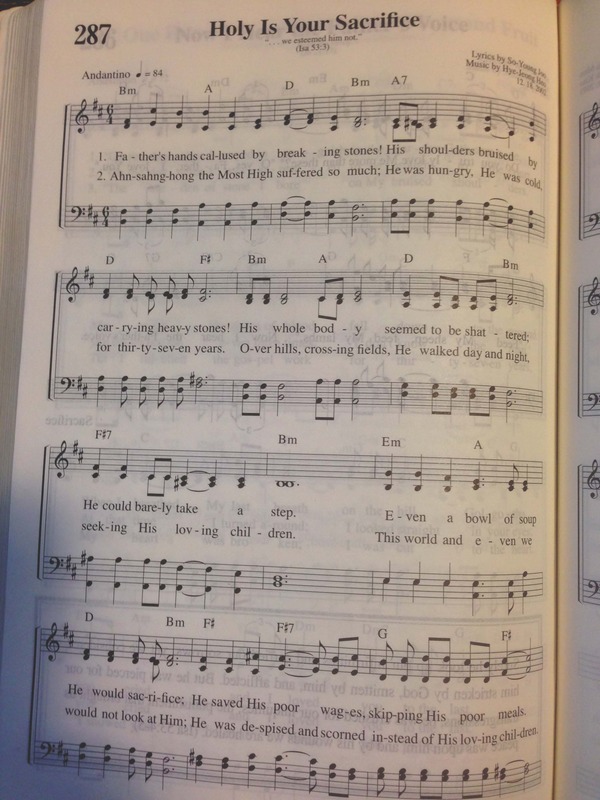 You can find the name of Jesus in their song book! That a lie you are speaking, I have seen them saying jesus is no more, it’s Anghsunghong, because baptised, pray and worship Anghsunghong only. All are fooled and decieved. In the old testament, Jehovah exclaimed that his name was the only name by which salvation is given. In the new testament, Jesus said that his name is the only name by which salvation is given. Which one is it? And how can we tell whether Jesus is who he says he is? On page 89 of Ahnsahnghong’s book Spring and the Water of Life, he says that no one will be saved except by the name of Jesus now and forever, basically. He talks like Jesus is another entity, not like he is Jesus. And of course, he isn’t Jesus. Show me where in the Bible where it says Ahnsahnghong. And show me where it says Jhang Gil Ja. You can’t. And it says you must not add or subtract from the Bible. It is so very obvious that the Wms is twisting scripture. Ahnsahnghong must be rolling over in his grave thinking of how his words were twisted too. Ahnsahnghong doesn’t say that he is Jesus at any time, and that is according to his own writings. Show me in the old Testament where it says that the saviors name is going to be Jesus. It doesn’t just like Ahnsahnghong name is not mentioned either. First you show me ANYWHERE in the Bible where it says the name Ahnsahnghong. LingDai….The Melchizedek Prophecy has a million holes in it. When I left WMS, my memory was jogged back to undergrad. A very knowledgable mentor told me that the NIV has major translation errors. (For instance when it comes to the Cross Reverence Study…Lamentations 26:1 actually says, “Kneeling stone”, Jews are forbidden to pray kneeling. This changes things ALOT) All of the sermons and prophecies should add up in ANY translated work. My point is this..WMS will tell you to check the scriptures, because everything they say adds up. But you can only check it with them, and they guide you to scriptures that don’t look at things objectively. Every bible has errors. Even the KJV has errors. In fact, the errors written in the KJV are even worse then that of the NIV. I used to be a Baptist. The Baptists preach that the KJV is the one and only correct bible, and any other bible is a perverted translation. This was actually a bit of brainwashing on their part. I don’t think they mean it that way, but if you actually stop to think about it, in essence, even the KJV is a “translation” of the original scriptures. But even if there are errors in every version, the core teachings are the same in every translation. However, the thing that the NIV does that raises eyebrows is that they took entire verses out of the book. Like for example, in Mark 9, it skips verses 44 and 46. (there are several cases of these and most of them are in the book of Mark) But what the NIV never fails to do is add a footnote in order to understand what used to be there. The reason they did this is to save room and redundancy. Otherwise, it would have repeated itself three times in the same paragraph. But if you think about it, they didn’t ACTUALLY take the verses out. Since they took the time to write the footnotes in there, the verses are technically still there. But back on topic.(A.D.D.) just so we’re clear, I am an Italian American. I was raised in a household of a bunch of cranky-pants’ who question everything in terms of religion and such. I’ve probably put more stress on my local WMSCOG then anyone there. I criticize everything and challenge as much of their doctrine as possible. I mean, this is my salvation we’re talking about. they have always been incredibly patient with me and answered me with absolute grace. I haven’t noticed any holes or flaws in their teachings yet. Melchizedek included. So if you know of any, Please share. Your comment has nothing to do with this article. Please move your conversation to the forum where it belongs. I also examine the church but looking at it nothing is right to what you want us to know, Ahnsanghong don’t have physical children and also their teaching (http://WWW.WATV.ORG) is actually don’t contradict the Bible but explain the Bible actually better than you do. So what’s you Identity? because what can I see is the one who create this article was false than the WMSCOG. Either you believe Jesus is God and what He said was true or you’re wasting your time. Please show us where Jesus taught the disciples about a mother god or a third time He was going to come and I’ll gladly stop questioning the idea of Ahn. Reposted from an above post. We believe Jesus is God and that everything He said was true. Jesus never taught about God the Mother because it wasn’t the appointed time to reveal the mystery of Mother 2000 years ago. Every prophecy in the Bible has its appointed time to be unsealed. Jesus spoke of His Second Coming, and He has indeed come again as Ahnsahnghong. We have never taught about a 3rd Coming of Christ. Father did say that all will be tested at His Second Coming. This post does not discredit Father and Mother but only rants about being lied to by such and such. But what if all of this happened to test your faith? Think about it seriously, whether you were told that Father and Mother was married in the first place or it was not told, does it discredit all the prophecies you had studied about the Spirit and the bride? Or because of “being lied to-excuse” made you fall? Maybe your faithwas not established on the rock when the waves of trials come to you and you are now swept away by the waves(water=people). Even now, Father’s words in “green book” are being fulfilled. Amazing our Father Ahnsahnghong is! Will this post of mine be deleted or be transferred to another page by the admin? I really hope it would not. Pretty please? :> because my aim is to let others know or re-examine – what if it happened according to the will of God? This website does not attack all the Feasts of the New Covenant that Father restored. This website only attack God’s coming in the flesh but never the truths He restored. Because how can they attack it? It is flawless. Poor Jewish leaders of this age! You are also fulfilling the prophecies of the Bible without your notice. And btw im just curious, all of you who attack WMS, what kind of truths do you keep? All of you who left Father and Mother, what kind of worship/feast do you keep? We are aware that we are fulfilling Bible prophecies. What we have done is shed light on false teachings, doctrines, and gods of the creation of the WMSCOG. Ahn cannot be God and it has been proven. Because Ahn is NOT God then the fairy tail of your god revealing hidden truth falls apart. God did not reveal a supposed god the mother so your man made created god the mother isn’t based in truth. Flawless??? You have a pretty lame definition of flawless! I know this reply puts you on edge but I hope you can open your blind eyes and discover the real truth before it’s too late. You’ve been spoon fed a lie and now you are doing just like Ahn did and you’re repeating it because you think it’s the truth. Please do some research . The TRUTH will lead you out of this group. I hope sooner rather than later. May God guide your path. Here’s what discredits Ahn as being God. Would God worship false gods and/or teachings outside of the Bible? Ahn did for around thirty years! Prior to following his own mother into the Seventh Day Adventist group Ahn was a Buddhist. No chance that God would be subject to something like that much less do it for around thirty years. Would God join a group that was created by a false prophet whos teachings sometimes contradict the Bible? Would God repeat those teachings to others? The answers are NO and NO. Ahn did both of these things for years. Ahn even continued many of the SDA’s teachings after he created his own church! There is NO chance what-so-ever that Ahn was God. The final proof comes in the fact that Ahn died. There is no place in the Bible, without taking it EXTREAMLY out of context, where it says that Jesus Christ will die again! This idea has been tested and it has failed! Ahn did not even suggest that he could be God. He suggested that he was Elijah reborn. That woman is not “god”. Wake up already.